When I was in Tucson recently, I marveled at the lack of orange sky glow over the city - the night sky was beautiful, and you could see many more stars from within the Tucson city limits, than I can see living 24 miles north of Detroit. See my previous post about Light Pollution. Venus continues to move away from Jupiter in the southeastern predawn sky; a waning crescent Moon joins Venus and Jupiter on the mornings of Jan. 29-31. Conjunction of Venus, Jupiter, the star Antares and the Moon in the southeastern predawn sky Jan. 29, 2019. Credit: Stellarium / Bob Trembley. Conjunction of Venus, Jupiter, the star Antares and the Moon in the southeastern predawn sky Jan. 30, 2019. Credit: Stellarium / Bob Trembley. Conjunction of Venus, Jupiter, the star Antares and the Moon in the southeastern predawn sky Jan. 31, 2019. Credit: Stellarium / Bob Trembley. Several familiar constellations and bright stars appear in the east-southeastern sky after sunset. Bright stars and constellations in the east-southeastern sky after sunset on Jan. 29, 2019. Credit: Stellarium / Bob Trembley. Mars appears high in the southwestern sky after sunset all week. Mars is a little getting higher, and drifting a little westward with each day. I haven't touched on the sky seen from the southern hemisphere in a while, so here's the southeastern sky at 11:00 PM as seen from Río Gallegos - far to the south in South America. Crux - the "Southern Cross" is visible, as is Rigel Kentaurus, another name for Alpha Centauri. In the southern sky: the position of the globular cluster Omega Centauri is highlighted in the southeastern sky as seen from Río Gallegos at 11:00 PM on Jan. 29, 2019. Credit: Stellarium / Bob Trembley. Br. Guy wanted to show me Omega Centauri while I was in Tucson, but sadly, it was very low on horizon during the Vatican Observatory Foundation's 2019 Faith and Astronomy Workshop, and the weather forecast called for clouds most of the week; I'll have to make sure to suggest having at least one predawn observing session. I've heard endless stories about how beautiful Omega Centauri is, so I thought I share it this week. Omega Centauri (ω Cen or NGC 5139) is a globular cluster in the constellation of Centaurus that was first identified as a non-stellar object by Edmond Halley in 1677. Located at a distance of 15,800 light-years (4,850 pc), it is the largest globular cluster in the Milky Way at a diameter of roughly 150 light-years. It is estimated to contain approximately 10 million stars and a total mass equivalent to 4 million solar masses. This video shows a zoom-in to Omega Centauri - I can't help but think of Dr David Bowman's exclamation from 2001 (book) or 2010 (film): "My God—it's full of stars!" 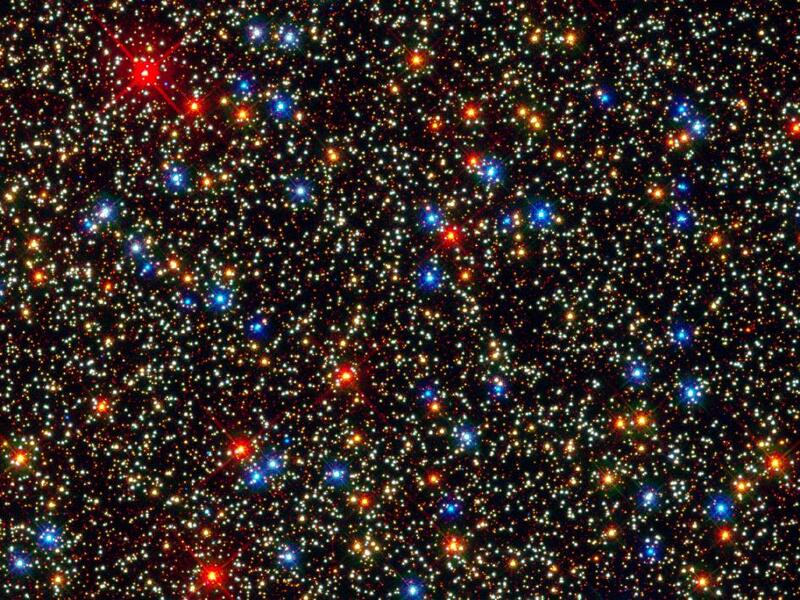 You might ask "What does a star cluster look like over millions of years?" The Moon is an waning crescent - just past third quarter. It will be visible low to the east before sunrise. The new Moon will occur on Feb. 4th. The northern coronal hole has opened up a bit since last week - the southern coronal hole is massive! Old sunspot AR 2733 is rotating out of view. SpaceWeather.com says: "A large hole in the sun's atmosphere is facing Earth and spewing a stream of solar wind in our direction. Extreme ultraviolet telescopes onboard NASA's Solar Dynamics Observatory photographed the structure on Jan. 28th"
Another Just WOW moment! Last week's beautiful HUGE prominence was in the lower right - this week, there's another one in the upper right! This one has a looping bridge between two hedge-row prominences. A couple other prominences can be seen around the Sun's limb. The solar wind speed is 360.2 km/sec (⇪), with a density of 5.7 protons/cm3 (⇪). On Jan. 28, 2019, the NASA All Sky Fireball Network reported 13 fireballs. Position of the planets in the inner solar system, Jan. 29, 2019. Credit: NASA Eyes on the Solar System / Bob Trembley. Position of the planets in the middle solar system, Jan. 29, 2019. Credit: NASA Eyes on the Solar System / Bob Trembley. Position of the planets in the outer solar system, Jan. 29, 2019. Credit: NASA Eyes on the Solar System / Bob Trembley. #ParkerSolarProbe has finished its first complete orbit around the Sun! 🛰🔂☀️ On Jan. 19, the spacecraft reached aphelion, the point in its orbit where it's farthest from our star. As I fly around Bennu during Orbital A, my scientific cameras are not collecting data. But my NavCam 1 imager is taking "OpNav" (short for optical navigation) images like these to help monitor my path around the asteroid. In other news: I've been playing with my VR headset after returning from Tucson, and just found Google Earth VR - where you can "fly like a drone" anywhere on the Earth. Some areas are built up with full 3D models, others are flattened satellite images. My wife launched into Zion Canyon and said "Oh WOW! I can see why Mom said we have to go here!" Now, if I could "fly like a drone" anywhere over the surfaces of the Moon, Ceres and asteroids Vesta and Bennu - THAT would be super cool! @googleearth VR BLEW my wife and I away!